President Donald Trump has embarked on a controversial 17-day vacation to his golf club in New Jersey. To help keep him safe, the Secret Service plans to use a security drone to monitor him and the surrounding area. The small Unmanned Aircraft System (sUAS) will be used as a proof-of-concept for future security work. The sprawling Trump National Golf Course in Bedminster will be monitored from about 300-400 feet above by the DHS drone. While most consumer drones have a battery life of less than an hour, the sUAS will utilize a microfilament cable that allows it to stay aloft almost indefinitely. The tether will provide power to the drone and transmit the video signal from the aircraft's multiple cameras. While details about the drone's specifics are obviously classified, it does make sense on a golf course where there are no real vantage points to observe the full area. Before drones, the Secret Service typically relied on helicopters or other manned aircraft for aerial surveillance. While they can fly higher than a drone, they need to refuel and are very loud. The DHS is also currently conducting a privacy impact assessment since the drone may inadvertently capture images of surrounding areas and other guests at the course. They are planning to notify everyone within the drone's field of view but say all images will be overwritten within 30 days unless the photos become part of a law enforcement investigation. merikafyeah and mcborge like this. 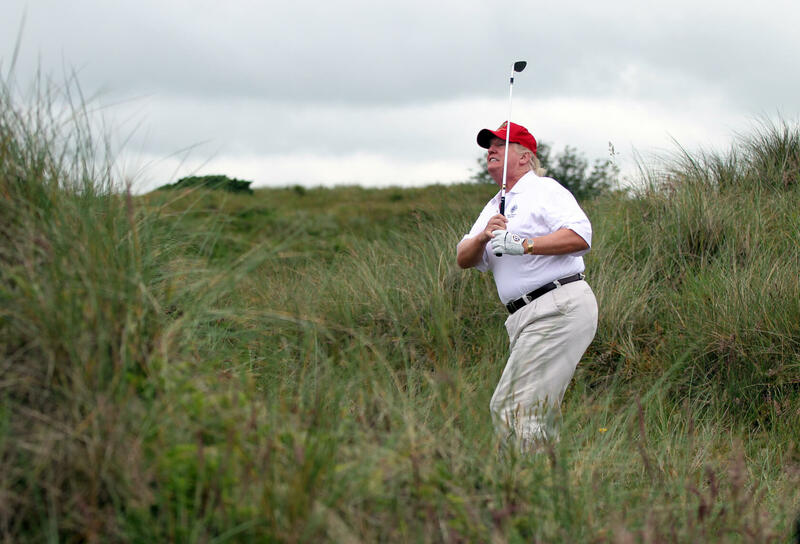 Considering the picture, they might be helpful finding a lost ball or three, of course now that the Secret Service has abandoned Trump Tower he's got plenty of armed spotters to do that so why bother with the drones? Certainly can't replace the faithful beverage cart! "I would rarely leave the White House because there's so much work to be done," Trump said in July 2015. "I would not be a president who took vacations. I would not be a president that takes time off." "Can you believe that, with all of the problems and difficulties facing the U.S., President spent the day playing golf. Worse than carter." "Pres. Obama is about to embark on a 17 day vacation in his 'native' Hawaii, putting Secret Service away from families on Christmas. Aloha!,"
"I'm going to be working for you," Trump said in August 2016. "I'm not going to have time to go play golf." BMAN61, Reehahs, Phr3d and 4 others like this. Here's hoping it falls on his fat head.
" the sUAS will utilize a microfilament cable that allows it to stay aloft almost indefinitely"
wouldn't rotation of several drones be an improvement over said drone being required to be line-of-site? (completely avoiding the low-probability entanglement in the many wooded acres as I'm sure only elite-corps drones' pilot would be assigned this duty). 300-400 feet average altitude, every measured old-forest trees' heights? nvm, I have complete confidence in this mission, it'll be the Best Ever in the history of drones and golf (and given the ahem, debate about the viewee's near-perfect golf game, vids of 'adjustments'.. when inevitably leaked.. should prove hysterical). Look at all these pissed off jobless hacks. How dare he takes a vacation from a very stressful job nobody appreciates. Was Trump a "pissed off jobless hack" when he was leveling the same exact criticism against Obama? The way I see it, he brought the criticism onto himself. If you're going to talk the talk then first walk the walk. BMAN61 and mcborge like this. I am sorry you feel that way when you see posts mocking someone for not doing what they said they were going to do. BMAN61 and penn919 like this.